Amanda Flower is one of two female employees in the Emerson College Police Department. 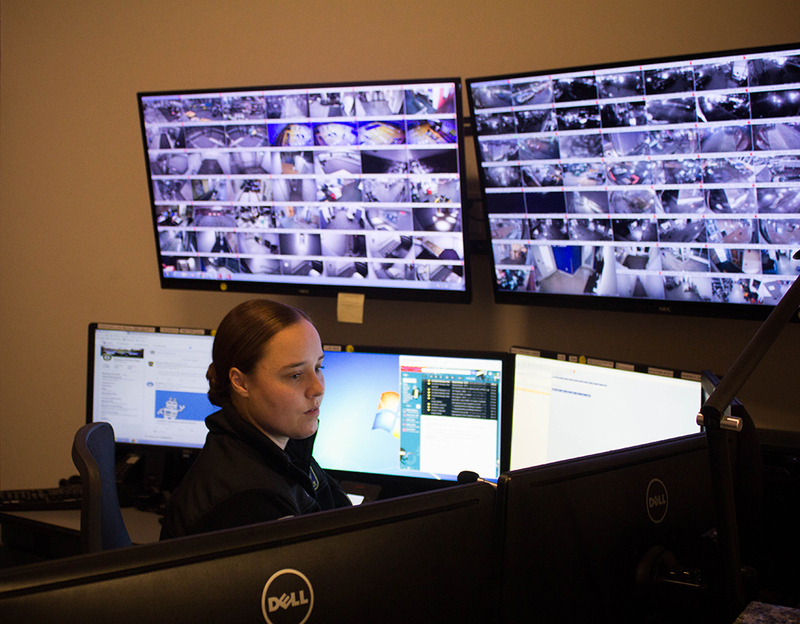 This year, two of the 28 people employed in the Emerson College Police Department are women. The department employed just one woman last year and has gone without women in the past. This year, 11 out of 167 ECPD officer applications were submitted by women. Out of the 11 women, only three had the necessary credentials, Smith said. The college interviewed two of them, while the other woman did not show up for the interview, Smith said. There are no women police officers employed. The two women that work at the ECPD are dispatchers. ECPD hired Amanda Flower eight months ago as a full-time dispatcher. Flower said she is not affected by the amount of men on the team, or by being one of the only women. In the ECPD, or any law enforcement group, there should be a spectrum of not just men and women, but of diversity in general, she said. ECPD hired the other woman, Sarah Mullen, this month as a part-time dispatcher. About 65 percent of Emerson students are women. Smith said ECPD wants to represent that in their workforce. Human resources put up general advertisements for openings on Glassdoor and Indeed, and ECPD Deputy Chief Eric Schiazza said he even tried to bring someone in from a wedding he attended. People interested in becoming an ECPD officer must either have six months of full-time training in a police academy or an associate degree in criminal justice, and must have about 300 hours of additional training completed at a reserve academy, according to Schiazza. Vice President for Diversity and Inclusion Sylvia Spears said having officers who represent the Emerson population is important. “Whether it’s racially or in terms of gender, our goal should always be to look like our student body, and if it isn’t the student body, the community around us,” she said. Some Emerson students do not feel comfortable communicating to the ECPD on incidents pertaining to sexual harassment. She said it’s a misconception that a man’s presence will make a student feel safe and there’s power in seeing a woman around, too. “We could have done better, but the reality is, there’s something inherent for the average Emerson student to have prejudice about the police because police officers have significant power to operate with,” the vice president and general counsel Christine Hughes, who supervises ECPD. Although a lack of female officers may create a barrier for students to feel secure in reporting incidents to law enforcement, Spears said there are other barriers in place, too. “As we know in our country, and in many other countries, reports to law enforcement trigger a system that does not have a long history of providing support, or even resulting in outcomes that are supportive to those who have survived [sexual] violence,” she said. When people are making a decision about where to report a sexual assault, Spears said, they have to make all of these decisions as to whether the process is going to unintentionally revictimize them. The Beacon reported last year on three students who said ECPD lacked timely response, trauma sensitivity, and appropriate followups in response to the students’ reports of assault. The three students, all women, witnessed and experienced sexual harassment on or around campus by a man fitting the same description. After all three accounts, ECPD failed to find the assaulter, who, according to numerous sources, moves extremely slowly and is seemingly blind. ECPD asked one of the women, Michelle Slivinski, to file a written report the evening of her assault, but according to Slivinski, she asked if she could file it the following day. She claims the officer told her a detective would call the next day to look further into the incident, but that she was never contacted. Another woman, Madison Martino, a junior marketing communications major, said she asked a campus advisory be sent out about the man on Oct. 21 of last year. Nearly two months after Slivinski’s report, and two weeks after Martino’s request, Smith sent a campus advisory out about a man fitting the description of the alleged assaulter on Nov. 9. Spears said having officers who identify as female and across the gender spectrum is really important, and it’s work the college needs to consistently try to improve. Although students are expressing their opinion verbally, Smith said the ECPD has not received any filed complaints or inquiries pertaining to a lack of women in the department. The police department also has a webpage for students to send in their compliments or complaints about an ECPD employee or their performance. Hughes said she has received just two complaints over the past two years from a female student pertaining to the ECPD officers.